At first glance, Cartier’s website oozes elegance and style. 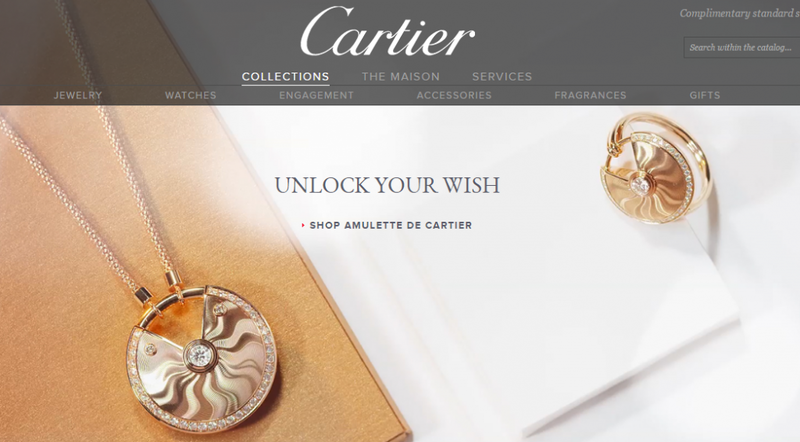 With bold phrases such as “unlock your wish” and a panther as their mascot, Cartier is a strong brand. But how does this brand relate to the quality of their diamonds? Read on below for our review of Cartier. With the strong brand that Cartier has established comes a stronger price tag, but not a stronger range of diamonds. If you plan to shop at Cartier, be prepared to have more limited options for a much heftier price. Cartier don’t sell loose diamonds, so we began by looking to compare two similar engagement rings between Cartier and James Allen. This process itself was extremely frustrating, unlike the much smoother ride that we had with James Allen, who we have previously reviewed here. It was very difficult to get pricing options, and we will discuss this process in greater detail under ‘The Shopping Experience’ section below. After searching around for other options, we found that we were able to view the prices for wedding bands, and so we decided to compare an 18K yellow gold 2.5mm wedding band from Cartier with the same ring on James Allen. These, of course, don’t contain diamonds themselves, but we wanted to get an idea of price comparisons between two similar sites. The ring on James Allen was priced at $230, while the same ring on Cartier was priced at $690 (we haven’t included any tax options here as this will vary depending on where you are located). We didn’t see any reason for needing to pay three times as much for a Cartier wedding band, other than having to pay for the brand’s name itself. In terms of the diamonds themselves, Cartier claim to only use specialists to select their diamonds and that they undergo a “most rigorous selection” process, but previous reviews have stated sales staff offering diamonds of a “very good” GIA cut. A “very good” GIA cut is not one of the best cuts available, and Cartier even go so far as to only sell “good” cut diamonds, and so it would seem that the way that Cartier market their diamonds and what they actually sell contradict each other. If you’re looking for an exceptionally high quality round cut or princess cut diamond, take a look at the A CUT ABOVE Diamonds line from Whiteflash. If you’re looking for Fancy Shape Diamonds take a look at James Allen. Cartier itself is a French luxury goods company. Its elegance can’t be denied, and they have sold many items to high profile individuals such as royals and celebrities, including Kate Middleton, the Duchess of Cambridge. Even King Edward VII of England said that Cartier were “the jeweler of kings and the king of jewelers.” Cartier are based all around the world, with their headquarters in Paris, France. Cartier was founded in 1847 and remained as a family controlled company until 1964. It is now wholly owned as a subsidiary of Richemont. They have created many notable products over their long history, and it sees them as one of the most luxurious companies around the world. As we mentioned above, the process of using the Cartier website was nothing short of frustrating. The various items that Cartier sell were laid out easily enough along the top of the website. However, the process of selecting an item, which in this case was an engagement ring, proved a difficult task. We’re big fans of websites such as Whiteflash, and James Allen in particular, because of the smooth selection process and the range of search options that they provide you. They essentially guide you down the route to be left with your perfect ring and diamond, with plenty of diagrams along the way. Cartier, on the other hand, simply ask you to pick one of their named engagement rings from the drop-down with no diagram, meaning you already don’t know what you’re looking for. After this you are presented with a page of dozens of pictures of rings that look very similar, and only a choice to filter these between category, collection or metal. Hovering over each of the diamonds provides some more information, but this information is extremely limited and remains the same for almost all of the pictures. For example, hovering over one says “platinum, diamond”. As we’ve come on looking for a diamond engagement ring and the picture shows a diamond engagement ring, the extra information of “diamond” didn’t exactly further our knowledge. After clicking through on an engagement ring the information remains extremely limited and hard to read, and no price options were available. You had to request price options by registering with their website. With a hugely limited amount of search options and information, and a messy “World of Diamonds” page, it’s extremely hard to know what kind of diamond you’ll be getting through Cartier, and it almost feels like you are shopping blind. Cartier don’t do enough to explain their diamond selection process, to show ASET maps or to explain cut grades. We got the feeling that Cartier find it more important to sell the Cartier brand name rather than the diamonds themselves. If you are 100% set on buying a Cartier ring then perhaps this isn’t a problem for you, but if you are scoping out the market and the price options, then this is a huge road block. We were able to compare price options between two wedding bands instead (covered above in the “Pricing” section), but this lack of continuity with displaying prices led to a very poor shopping experience, made worse by the website itself, which we have covered below. Unfortunately, the website was just too difficult to use. With a premium price tag should come a premium experience. Again, we feel like Cartier are too confident in their own brand to make the user experience easy and all of the information accessible. For example, we had to search elsewhere on the internet to find out about the company’s history! Other information on offer, such as the information regarding the diamonds, was far too limited or lacking. The background color changed from white to a black/dark maroon color depending on what page you went on, and while this isn’t exactly a major turn off, the lack of continuity made it hard to associate with the brand, and can make it feel like you are on two different websites at times. The imagery on the Cartier website is mixed. Of the diamond products themselves, the imagery is commendable, with multiple angle options to view the product that you are buying. However, as we mentioned, there are no ASET map, video imaging or ideal scopes, and so, ultimately, the diamond images aren’t good enough. I highlight the importance of diamond imagery in an article here. Furthermore, other images, such as of the wedding band that we compared earlier, seem to be pre-rendered and do not display an actual image of the product itself, which for us is a big red flag. Finally, the rest of the website contains grand images of panthers, floating watch mechanisms, landscapes and unrelated images, all to further lend to Cartier’s image of elegance. While there is nothing wrong with this and it gives a nice feel to the website, we are here to review diamonds, and without proper images of the diamonds, it seems that too much time has been spent on sourcing grand images, rather than the technical images which are more important to a savvy diamond shopper. As we have already mentioned, the choice at Cartier is somewhat more limited, not only in the search options, but also in the actual range of products themselves. It’s extremely hard to know exactly how Cartier sources their diamonds, what kind of diamond you will get, and to choose between the varying products. The returns policy is similar to other companies, allowing you 30 days to return a product, and if Cartier are satisfied with the product, will issue a refund or exchange. Products must be returned in a new and unused state. There are a few terms and conditions that relate to the returns policy with Cartier, and we would recommend reading this before making any purchases. Cartier is a well-known and household brand name that has connotations of elegance and wealth. If you have a Cartier product, this is something that you can show off to those around you and probably impress. We know this review has leaned more on the negative side, but this isn’t to take away from the “wow factor” that a Cartier product will deliver. That being said, the quality is lacking with Cartier, both in terms of the user experience and the way in which they sell the products themselves. Cartier seem to assume that customers will just want to buy with them and not need to know specific information regarding diamond cut and quality. If you know you want a Cartier diamond product and the quality of the diamond is not the highest priority, then you’ll will be left with a fantastic setting, although you can’t guarantee the quality of the diamond. If you are more concerned with having a good quality diamond, we would recommend using other diamond sellers such as James Allen, Whiteflash, or Blue Nile.